Chair Cover Hire, providing elegant high quality char covers adding that perfect finishing touch to your special event. 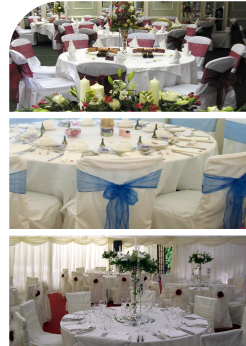 service - the chair covers looked lovely." Charming Covers hire and supply Chair Covers to individual bride & grooms, party organisers and corporate event planners for use in a number of hotels, marquees and a variety of other venues throughout the Midlands and beyond. Charming Covers also provide a NATIONWIDE postal service for their white lycra and coloured covers. birthday, christening or corporate event just to name a few!! day! Or why not choose our postal LYCRA chair cover service. the ‘perfect fit’. Or if you choose our postal lycra chair cover service we would be happy to post you a sample for you try on the chair yourself. If you do not have chairs available – we are also able to provide these as well. Our price of £2.50 per linen chair cover includes a complimentary coloured sash, delivery, set-up and collection within our catchment area – there are no hidden charges! Our postal lycra chair cover service starts at 99p per chair with sashes an additional 25p each. We have a range of coloured sashes available which we can match to your ‘colour scheme’ adding a further personal touch to your event. To enquire about our Chair Cover hire service please call us on 0121 240 1470 or email at info@charmingcovers.co.uk. Worcestershire. And many more areas………..